About Us And Mission Statement - Our Lady Of Mercy National School, Stradbally, Co. Waterford, Ireland. About Our Lady of Mercy N.S. Our Lady of Mercy National School is a Catholic Primary school in the seaside village of Stradbally, Co Waterford. It is a co-educational school,serving infants to sixth class, providing the children of the community with an open friendly secure learning environment where the intellectual, spiritual, physical and emotional needs of the pupils are identified and nurtured by a dedicated teaching staff. We provide the children of the community with an open friendly secure learning environment where the intellectual, spiritual, physical and emotional needs of the pupils are identified and nurtured by a dedicated teaching staff. We foster an appreciation of culture, language, history and traditions in the children. We strive to provide a well-ordered, happy, secure atmosphere in the school where the self esteem of each child will be enhanced. We aim to foster a strong sense of community involving children, school staff, parents and the wider community of Stradbally. We recognise that the parents are the primary educators of their children, the school aims to collaborate with them in their child's balanced growth and development. 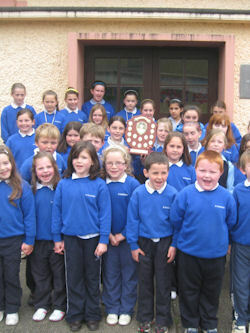 Our Lady of Mercy National School, Carrighilla, Stradbally, Waterford.